Cottage #16 (formerly known as cottage C) is both spacious and unique that includes three upstairs bedrooms and first-floor kitchen, living room and bathroom. #16 sleeps up to 6 people. Bedroom #1 has a full size bed and a twin bed. Bedroom #2 has two twin beds and Bedroom #3 has one full size bed. Cabin #17 (formerly known as Cottage B) was completely remodeled in 2017 and includes 2 bedrooms, both with 1 queen bed. It also has a refrigerator, gas stove, microwave, coffee maker, toaster, dishes and pans and is air conditioned for your convenience. Cabin #18 (formerly known as #1) was recently remodeled, and the unit was gutted and completely redone inside. It’s laid out like a small motel room, but gives you the privacy of a free standing unit. It has one queen bed with a refrigerator, coffee maker, microwave, and air conditioning. Cabin #6 has a knotty pine interior with an ‘up north’ look and feel throughout. The cabin has one full size bed, newly remodeled bathroom, air conditioning, and the kitchen is fully equipped with refrigerator, microwave, coffee maker, gas stove, dishes, pans, and toaster. Cabin #20 is our cozy garden themed cabin that offers one full size bed, and includes a microwave, mini-fridge, coffee maker, and air conditioning. 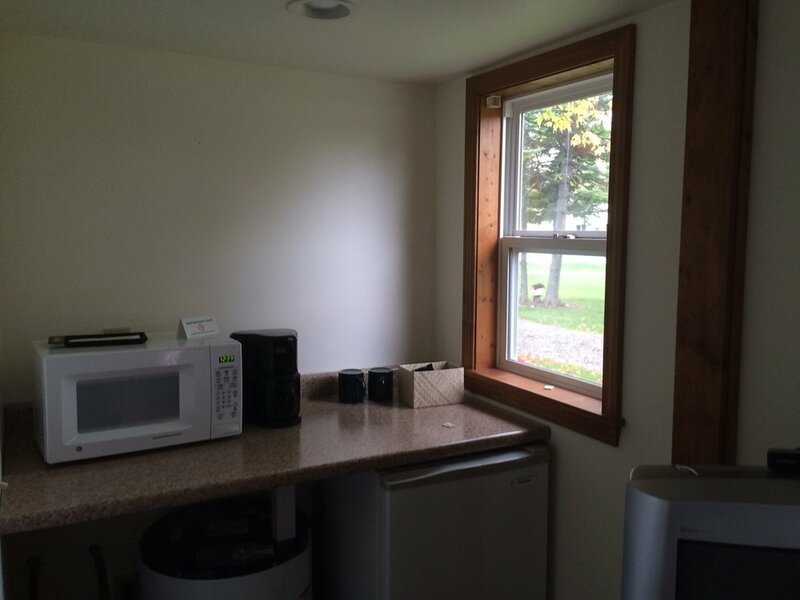 These are newer built cabins with 2 bedrooms in each unit with air conditioning. The bedrooms have one full size bed in each room. Formerly, cabins 4 and 5, cabins #21 and 22 share a common wall and exterior deck. Each kitchen has a gas stove, microwave, refrigerator, dishes, pans, toaster, and coffee maker.